ASTM A182 Stainless Steel Socket Weld Fittings, ASME 16.11 SS Socket Weld Fittings, ANSI B 16.9 Stainless Steel Socket Weld Tee, Steel Socket Weld Elbow, SS Socket Weld Union Exporter In India. ACE ALLOYS LLP is a well-known Stainless Steel Socket Weld Fittings manufacturer and supplier in India. Our SS socket weld pipe fittings are well known for their resistance of corrosion from chemicals and radioactive materials. 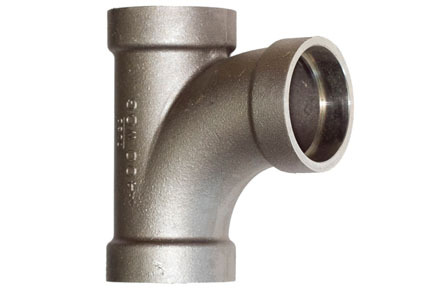 We also specialise in SS Forged Socket Weld Fittings known for their seamless appearance. Stainless steel is used because of its corrosion resistance. We recommend stainless steel fittings where appearance and durability are of utmost importance. They are easy to clean. Products made from stainless steel are very ductile and are easy to mould and weld in different shapes. They remain tough when exposed to low temperatures. We are quality stainless steel socket weld fitting supplier. We cater to a wide range of industries like chemical industries, power generation, ship-building, paper manufacturing, petrochemical, and pharmaceutical industries. A few of the fittings we provide are SS Socket Weld Coupling, SS Socket Weld Cap, SS Socket Weld Cross, SS Socket Weld Tee, SS Socket Weld Elbow, SS Socket Weld Reducer Fittings. These are widely used and we do maintain a large inventory for our clients. The ASME / ANSI B 16.11 SS Socket Weld Fittings, ASTM A182 Steel Socket Weld Pipe Fittings, 304 Stainless Steel Socket Weld Fittings and 316 Stainless Steel Socket Weld Fittings are the common grades that our esteemed customers request for. At ACE ALLOYS LLP, we provide a range of fittings and grades of stainless steel which can be customised as per your company specifications. Call us today, we guarantee you the best quality products at affordable rates. Request the latest Stainless Steel Socket Weld Fittings Price List. Use the contact button below for Stainless Steel Socket Weld Fittings Ready stock information and updated price list.